Founded in 1826, the Zoological Society of London (ZSL) is a charity devoted to the worldwide conservation of animals and their habitats and the proud owners of Whipsnade and London Zoo. Fordingbridge are delighted to announce our collaboration with ZSL to deliver a new sustainable entrance building for their Whipsnade site in Dunstable. This project is of great importance to Fordingbridge thanks to the vision we share with ZSL for creating sustainable and attractive environments. 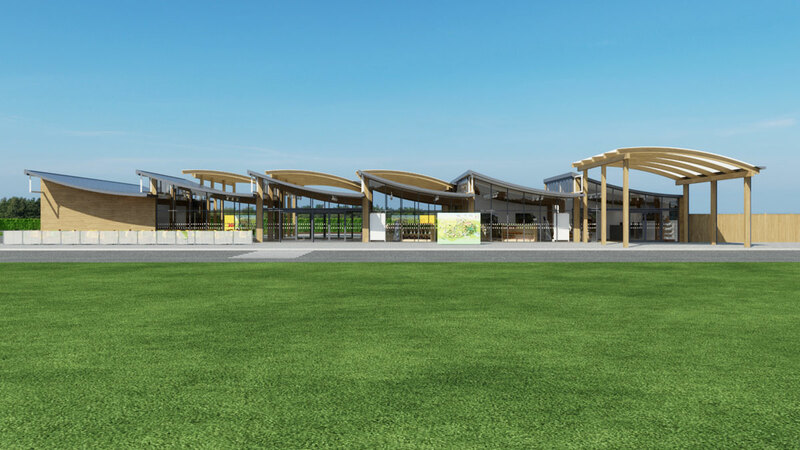 The new entrance building at Whipsnade will dramatically enhance visitor experience and is the first of a group of projects that are planned for the charity across their two sites in 2015. The entrance building design focuses on creating a light, open and permeable space creating transparency to the Zoo beyond; increasing the excitement and providing a seamless entry for the Zoo’s visitors – a large triple span glulaminated timber canopy will also provide extra undercover queuing and retail opportunities. See our video below. A single large area allows ticketing, retail and café functions all in one space and ensures the Zoo is better equipped to welcome the greater number of visitors expected in the near future. Construction commences in the New Year with completion of all projects due in July 2015. Check back for announcements on further projects for ZSL and visual updates of the build.